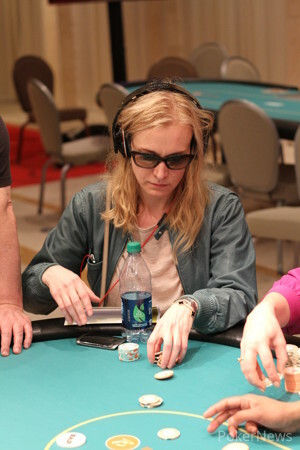 Borgata Poker Open Ladies Event. In the last 2 weeks I played in 3 poker tourneys. In two of them I finished right on “the bubble” – a poker term that can be described as “close but no cigar”. To finish on the bubble is the most frustrating element of poker tournaments. You feel like a guy who keeps going on dates but never gets invited upstairs after a date. You spend all this time working hard on a project and then, as you come within a grasp of a win, it slips away. If you busted midway, at least you didn’t have to spend 12-13 hours grinding at the poker table. I busted out of two tournaments in this manner. But, in the third one, the Borgata Poker Open Ladies event, I finally broke the spell and finished in the money. This is me after playing for 14 hours. Here’s full reporting from last night’s game, with pictures, stack sizes and hands. And here’s one of the hands that carried me through. Congratulations after a long day. Sounds like a minimum wage job…:) Good luck in the future tournaments!